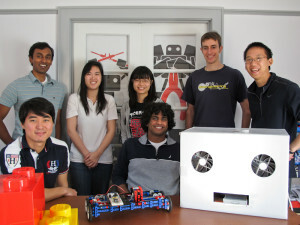 The Robot Brigade is a small group of programmers and engineers with day jobs ranging from robotics to cancer research. Projects by Robot Brigade are purely extracurricular, making each product extra special and fun. We love everything robot related! From constructing paper robots to designing D.Bug kits to prototyping a cookie cutting robot, we enjoy working together as a team and feed off of each other’s drive and knowledge.